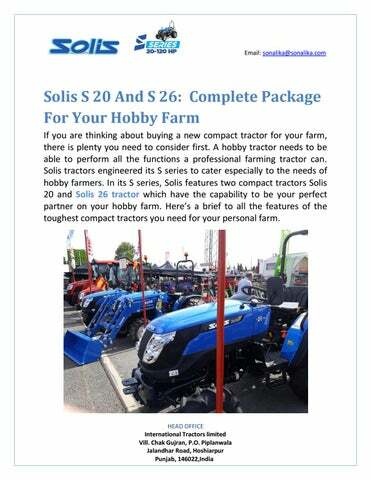 Solis S 20 And S 26: Complete Package For Your Hobby Farm If you are thinking about buying a new compact tractor for your farm, there is plenty you need to consider first. A hobby tractor needs to be able to perform all the functions a professional farming tractor can. Solis tractors engineered its S series to cater especially to the needs of hobby farmers. In its S series, Solis features two compact tractors Solis 20 and Solis 26 tractor which have the capability to be your perfect partner on your hobby farm. Hereâ&#x20AC;&#x2122;s a brief to all the features of the toughest compact tractors you need for your personal farm. The Maneuverability Factor A hobby farmers need to be agile and easy to manoeuvre on the small area of personal farms. Solis compact tractors are build while keeping this factor in mind. The Solis 20 tractor features a slick turning radius of 2.3 meters, whereas Solis 26 can turn at a radius of 2.1 meters. The track width of both tractors is also very suitable for small farms. relatively quiet ride which is very comfortable for the operator. Also, it is more fuel efficient of the two. In the end, choosing among the two Solis compact tractors becomes a choice of personal preference. If you would like a more silent, fuel-efficient compact tractor go for S20, or you would prefer S26 which is slightly more featured.